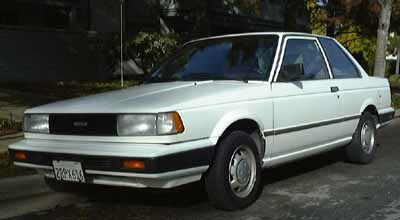 This is the 1990 Nissan Sentra. It is the best snow car ever made. If you cannot afford one, you might try the 1971 Ford F250 3/4 ton pickup (in red), which is arguably the second best. Make sure you get the red, as other pickup colors are inferior. My Sentra started the ski epic with 141,856 miles on it, which for a Sentra is just getting broken in properly. 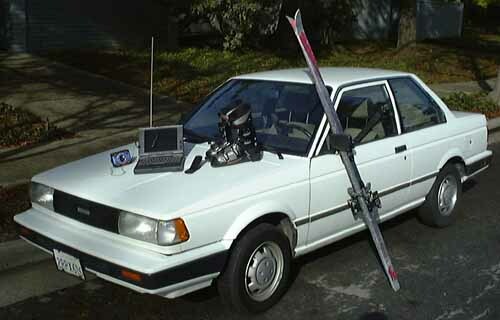 At the end of the ski epic, the sentra had 151,048 miles on it. About 9,200 miles in 86 days. Above is my Sentra with some of my gear. K2 FX 11.2 skis, Nordica Grand Prix 80 ski boots, an Apple Powerbook 5300cs with 3COM Megahertz cellular modem, Motorola StarTAC cell phone, and a Panasonic sports walkman. 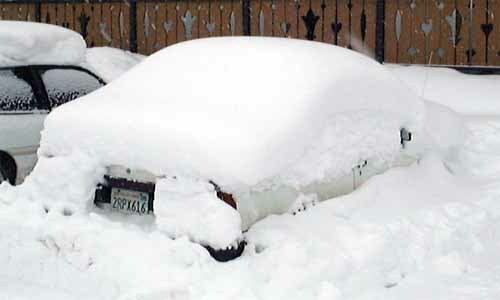 Below is a picture of my Sentra in its element in Sun Valley, Idaho. That's 25 inches of snow that fell overnight. Any other vehicle might have troubles getting out, but don't worry, this is a 1990 Sentra.